Week of October 15, 2012: We have officially wrapped up another successful season of helping farm families who have experienced unexpected crises. We are thankful for volunteers, sponsors, staff and media outlets that make Farm Rescue operations a reality. We couldn't help families without their support. It is inspiring to see people and businesses actively supporting Farm Rescue so we may help farm families during an unexpected crisis. Financial constraints are always the limiting factor in a nonprofit organization like Farm Rescue. We mobilize volunteers and equipment as our funding allows. We depend on business sponsorships, grants, public donations and media outlets to accomplish our mission. We are nearing the end of harvest season. One more family to assist with corn harvest due to an illness. The weather has cooperated this year for a wonderful harvest season and we are now preparing for our annual banquet on October 19. Visit our home page to make your reservation now. There are also a few raffle tickets remaining for an opportunity to win some really cool prizes. Raffle drawing is at the banquet. Need not be present to win. 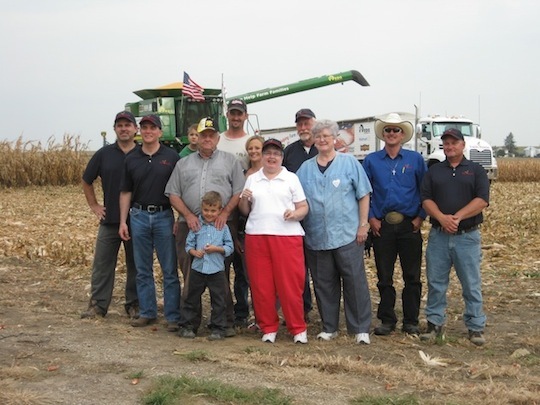 Week of September 24, 2012: 200 Farm Families ! Yes, it was a very important week for everyone at Farm Rescue to achieve this milestone. We helped 10 families during our first year of operation in 2006, and now we are assisting approximately 50 families per year! It has been a monumental task to start a nonprofit organization from scratch and seven years later be helping farm families in North Dakota, South Dakota, Minnesota, Montana and Iowa. This is due to our dedicated volunteers and sponsors who support the mission of Farm Rescue. The mission of planting and harvesting crops for farm families who have experienced a major injury, illness or natural disaster so they may have an opportunity to continue their livelihood. This is good for rural communities, agribusiness and everyone in America. Farm Rescue's assistance increases the likelihood of future generations of family farmers. A huge THANK YOU to all volunteers, sponsors, donors, media, and all who support our mission of helping farm families during unexpected crisis ! Farm Rescue volunteers, RDO Equipment Company sponsored combines and Wilson Trailer hopper-bottoms were busy in North Dakota, Minnesota and Iowa this week harvesting corn and soybeans. Levi, Carol and Will kept the Iowa operations going while Jim Whitman, Pete Von Bank, and Terry were busy in North Dakota and Minnesota. Our good-hearted volunteer, Dave Hertel, flew into the Fargo airport from Chandler, Arizona. He then hit the rode to deliver a combine header from Fargo to State Center, Iowa where he met volunteers Levi Wielenga and Will Rudolphi to harvest corn. Volunteer Jeffrey Larson has also been busy working for Farm Rescue. He moved a header and then a semi and hopper bottom to Iowa. Rita Jarrett, Amy Remboldt, and Calli Stoudt attended the Impact Foundation seminar in Fargo to learn how grow and improve Farm Rescue even further. Week of September 3, 2012: Another busy week at Farm Rescue. While Charlie Bartsch and Tyler Lautenschlager finished harvested flax at Max, North Dakota for a farmer recovering from rotator cuff surgery, Pete Von Bank was diligently working behind the scenes moving combines to locations where Farm Rescue volunteers are conducting harvest operations. Even Rita, our office and outreach coordinator, has been on the road for Farm Rescue this week as she drove to Aberdeen, South Dakota to pick up a booth from Jerry Krueger who was staffing our booth at the South Dakota State Fair. Our founder, Bill Gross joined Todd, Tim and Tanner Thompson in harvesting soybeans at Ulen, Minnesota for a family battling cancer. Meanwhile, Jim Whitman was getting ready for the upcoming booth at Big Iron in Fargo, North Dakota. Check out our booth and don’t forget to purchase a raffle ticket for your chance to win a brand new John Deere Camo gator ! Volunteer Gary Deckert and his wife JoAnn pose before driving the semi in the Barnesville Potato Days parade. Week of August 27, 2012: Happy Potato Days! 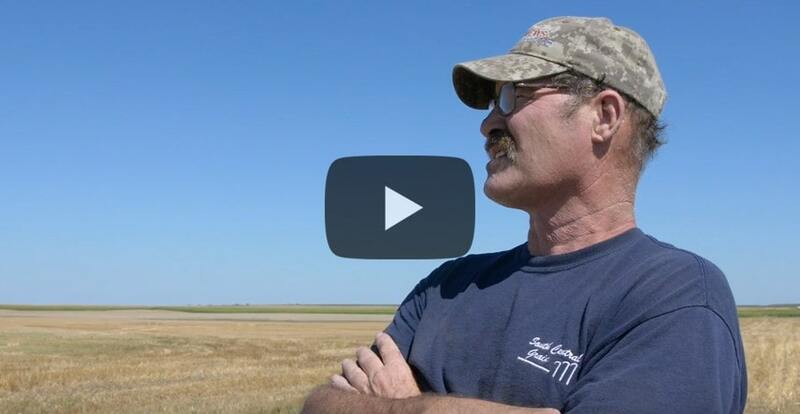 Charlie Bartsch and Dave Larimer harvested 275 acres of wheat in Max, ND for Larry and Diana Halden. Larry is recovering from rotator cuff surgery. Jay Schepp and Pete Von Bank finished harvesting in Mercer, ND for Frank Wardner who recently suffered from a stroke. Meanwhile, in Boone, IA, our regional operations manager Jim Whitman exercised his great social talents at the Farm Progress Show by passing out brochures in the hospitality tent as well as at the antique tractor show. After these events, Jim and Charlie headed to South Dakota and set up a booth to get the word out about Farm Rescue. We have wonderful volunteers. 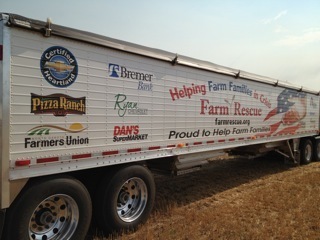 If they are not planting or harvesting crops, they are attending farm shows and parades throughout North Dakota, South Dakota, Minnesota and Iowa to raise awareness of the available assistance to farm families through Farm Rescue. Week of August 20, 2012: It has been a very soggy week for our Farm Rescue volunteers. Charlie Bartsch and Rod Eckroth started harvesting in Perth, North Dakota for James and Carrie Boe. James is unable to climb into his combine this year due to a broken leg. However, they were soon rained out for much of the week. Gene Spichke, Warren Zakopyko, and Will Rudolphi made good progress harvesting in Balfour, North Dakota until the clouds came and rained on their parade. This case involved the harvest of barley and canola for the Duchsherer family in Balfour, ND as their daughter recovers from an accident in which she was run over by a pickup truck. It’s still not too late to get harvest applications into our office. If you know anyone who may be struggling to get the crops in during this harvest season, please call our office as soon as possible so we may have a chance to help them. Week of August 13, 2012: We harvested canola and barley for two families recovering from injuries. The teams are moving this weekend to Mercer, ND (illness case) and Max, ND (injury case) to continue harvesting wheat. The compassionate volunteers who provided a helping hand this week included: Garry Deckert - Bismarck, ND, Bill (Will) Rudolphi - Champaign, IL, Michael (Rudy) Rudolphi - Scottsdale, AL, Charlie Bartsch - Minot, ND, Gene Spichke - Keif, ND and Warren Zakopyko - Balfour, ND. 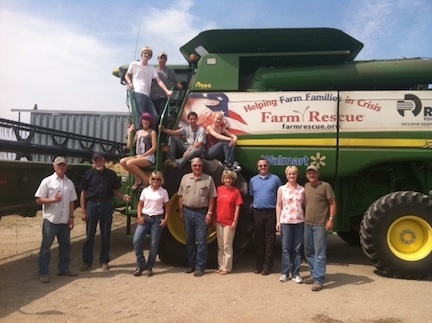 The volunteers enjoy working together to help farm families through Farm Rescue. It is wonderful to see gracious volunteers stepping forward from all walks of life and various regions of the United States. The enthusiasm of our wonderful volunteers is inspiring. Thank you for keeping our operation moving forward. We also wish to thank the farm families and FSA (Farm Service Agency) staff for providing great food for the hard working volunteers. Thank You! 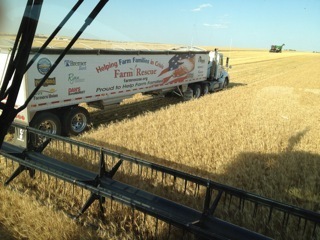 Week of August 6, 2012: We made good progress harvesting wheat in North Dakota at four different family farms. Two of the families are dealing with illnesses and the other two are recovering from injuries. We had great volunteers this week from various parts of the United States. A big Thank You to: Garry Deckert - Bismarck, ND, Jerome Hoffman - Gary, SD, Jack Rutledge - Peachtree, GA, Bill (Will) Rudolphi - Champaign, IL, Michael (Rudy) Rudolphi - Scottsdale, AL, Mark Olson - Binford, ND, Charlie Bartsch - Minot, ND, Gene Spichke - Keif, ND and Warren Zakopyko - Balfour, ND. 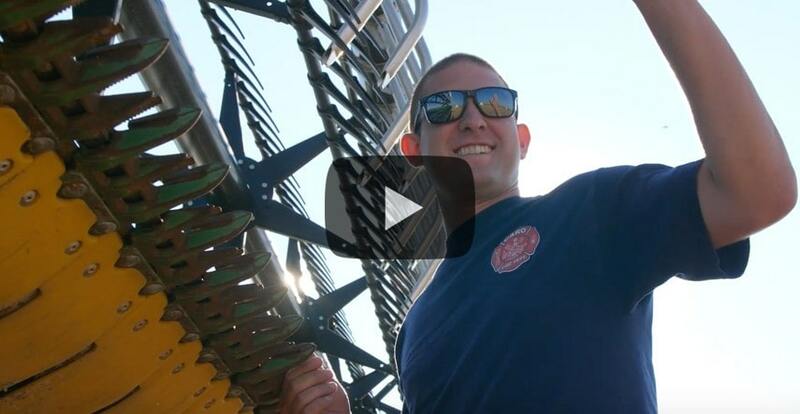 Shaun Sipma (pictured above) is sporting a Farm Rescue cap while operating the RDO Equipment Company sponsored combine. Looking sharp in Farm Rescue attire Shaun !! The hot weather has caused the crops to ripen very quickly and time is of the essence. We plan to harvest wheat until September 1 and then prepare for corn and soybean harvest. We have spoken to many farmers which say the corn will actually be ready to harvest prior to the soybeans! It is turning out to be an interesting harvest season. We continue to accept harvest applications in North Dakota, South Dakota, Minnesota, Iowa and eastern Montana. We are helping as many farm families as possible. Thank you to the Farm Rescue volunteers and sponsors ! Week of July 30, 2012: Wheat harvest came early for Farm Rescue due the unusually hot weather this summer. The volunteers did a great job keeping the Farm Rescue semi-trucks and RDO Equipment Company sponsored combines in motion near Munich and Regent, North Dakota. There were volunteers present that came all the way from Atlanta, Georgia ! 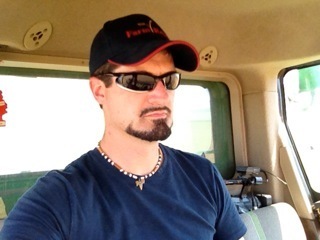 We also owe a special Thank You to Shaun Sipma for volunteering to operate a combine for us on short notice when another volunteer couldn't make it from Pennsylvania. The teams are now moving to continue wheat harvest at the next Farm Rescue cases located at Hettinger and Balfour, North Dakota. Both of these cases are injury related cases. The Hettinger case is a head injury resulting from a fall, and the Balfour case is an unfortunate accident of a daughter being run over by a car. Week of July 23, 2012: Farm Rescue held press conferences in Iowa announcing its expansion into Iowa to help farm families who have experienced a major injury, illness or natural disaster. 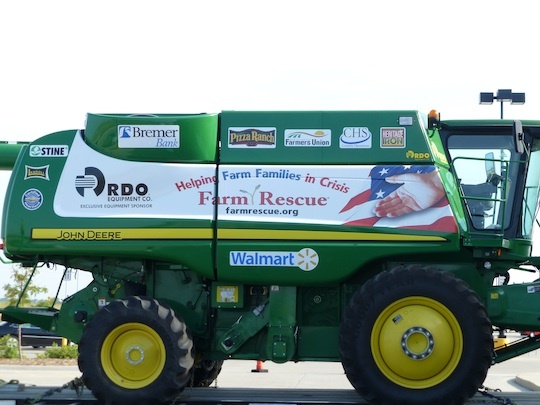 RDO Equipment Company sponsored combine will go on tour at select Walmart locations throughout Iowa. People may participate in a "guess the weight" contest to win a $100 Walmart gift card. (One winner per contest location.) Visit our home page and click on "where is Farm Rescue now" to view the contest locations and dates. We are pleased to announce the sponsors responsible for helping us launch operations in Iowa: RDO Equipment Company, Walmart, Pizza Ranch, Wilson Trailer, Stine Seed, Key Cooperative, Vander Hagg's Inc., First Citizens National Bank, ClearChannel Outdoor, American State Bank, Heritage Iron, Sudenga, Lamar, and UPS. Farm Rescue is currently accepting applications for harvest assistance in North Dakota, South Dakota, Minnesota, Iowa, and eastern Montana. Week of May 28, 2012: Farm Rescue has wrapped up another successful planting season. The 60-foot air seeder returned to it’s home at RDO Equipment Company in Washburn, North Dakota. The 50-foot air seeder has just finished it’s last planting case and is enroute to RDO Equipment Company in Hazen, North Dakota. Jim Whitman, Steve Lang, and Charlie Hardie are currently finishing seeding soybeans with the 66-foot planter for a farmer in Jud, North Dakota. Our thoughts and prayers will continue to be with the families assisted. We hope they find healing and strength through times of difficulty. We are humbled to be given the opportunity to help them during their season of need. Farm Rescue is extremely grateful for all of the sponsors, volunteers, and the good people at RDO Equipment Company who have made it possible to improve the lives of farm families and rural communities. Thank you so very much. We look forward to working with you this harvest! Week of May 21, 2012: Our volunteers experienced a rainy weekend. Levi, Carol, Jack, and Tim return to their homes after volunteering for several weeks. We thank them from the bottom of our hearts for their service! Charlie finished seeding in Harvey for Mike Lesmeister as he recovers from surgery for a detached retina. Jim and Clarence started planting soybeans in Ypsilanti before they got rained out. 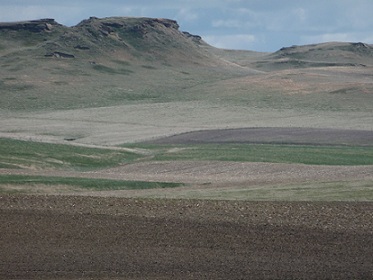 Our volunteers have been enjoying the natural beauty of north-western North Dakota. Week of May 14, 2012: Levi, Carol and Jim finished seeding small grains for farmer, Leon Schmaltz, who suffers from a detached retina. Charlie, Jerry, and Steve planted soybeans in Gackle for Elmer Schlecht as he recovers from heart surgery. Jim joined volunteers Jack and Ted in Aneta where they planted soybeans for farmer, Mike Hanson, who was diagnosed with MS. The team then headed to Ypsilanti to help plant soybeans for Gary Marks who is recovering from a broken leg. While in Ypsilanti, the Gary’s family and the Farm Rescue team team enjoyed a nice meal delivered to them by the good-hearted ladies from Farm Service Agency in Jamestown. Subway of Jamestown also donated chips and sandwiches to the crew. Trish Gehlhar, Ardis Boehmer, and Sheryl Carlson take time out of their busy day at FSA to deliver meals to Gary Marks’ farm. 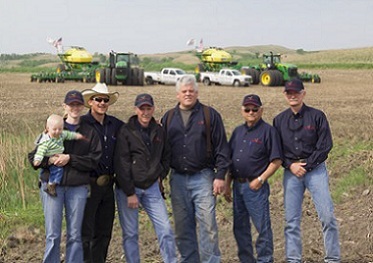 May 7, 2012: In Alsen, ND, Levi, Carol, and Jim Randolph (a new volunteer from Virginia) seeded wheat, canola, and durum for farmer, Terry Roppel, as he recovered from heart surgery. They then headed to Egeland, ND to complete planting there. 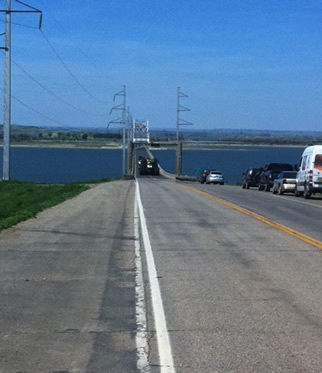 Afterwards, the crew headed to Sarles, ND to seed for a farmer who underwent emergency surgery. Meanwhile, Charlie and Rod, seeded 800 acres of wheat in Flasher, ND. 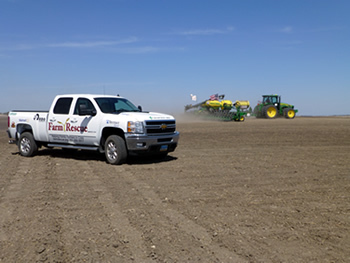 Once finished in Flasher, Charlie, Jay, and new volunteer, Brian Matzke, moved planting equipment to Hoven, SD to plant soybeans for a farmer battling cancer. 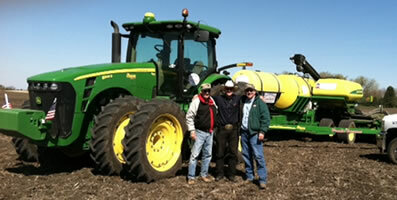 In Peever, SD, Jim Whitman and Jack planted corn for a farmer recovering from surgery. 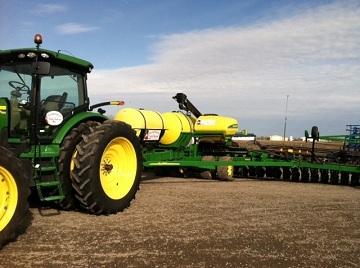 They moved the equipment to Rogers, ND and are now planting soybeans for a farmer with respiratory problems. On the road again. 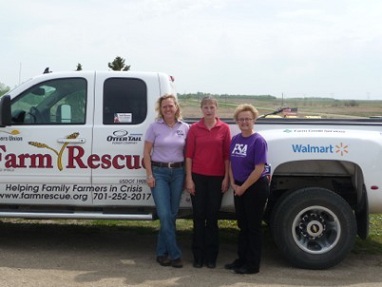 Farm Rescue equipment is on the road again to help the next farm family in crisis. April 30, 2012: Levi and Steve finished seeding in Edmore. They then headed to Egeland to seed for Richard Thomas who is fighting cancer. Jim, Jack, and Charlie finished planting at Peever, South Dakota for David Argo as he recovers from surgery. Rain clouds entered in and rained out the volunteers. 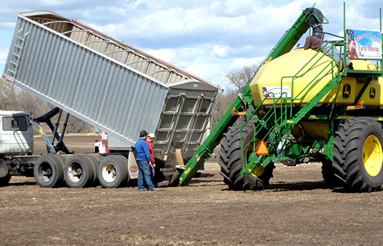 Charlie and Rod started seeding in Flasher, North Dakota until the rain momentarily stopped their operations. The rain continued to pour on Friday leaving our heroes soggy and antsy to get back out into the fields. April 23, 2012: Volunteers Dave Sette and Mark Olson seeded in Glenfield for farmer, Randy Stedman who suffers from a medical illness. Charlie Bartsch and Dale Lamphere finished seeding in Hazen, ND for farmer Bob Kilber who suffered severe injuries from a car accident. Dave and Mark headed to Edmore where they are seeding for a farmer with a broken leg. Meanwhile. 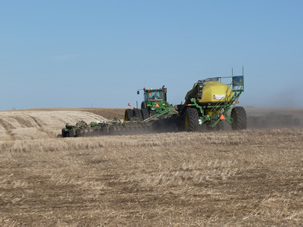 Jay and new volunteer, Rod Eckroth, started seeding in Flasher, ND for a farmer battling cancer. Ken, Jim, and Jack Rutledge finished planting corn in Aneta, ND and moved to Peever, SD. Levi Wielenga, Ken Chyle, Bill Gross, and Jim Whitman planted crops in for the Klemetson family Ulen, MN. Our thoughts and prayers are with the family as Staci Kelemtson, wife and mother of five (ages 13 to 2) undergoes chemotherapy. April 16, 2012: The week started out as muddy soup due to a long, rainy weekend. Prior to the rain, our lovable volunteers managed to accomplish a massive amount of work. The crops are in the ground in Clarkfield, MN where farmer Keith Hanson recovers from some recent seizures. Dave Sette, Ken Chyle, and Dan Pullum have also successfully planted crops in Java, SD. Meanwhile, Charlie Bartsch, Tyler Lautenschlager, and Jay Schepp worked hard to finish planting crops in Robinson, ND. April 9, 2012: Spring has sprung for Farm Rescue. Field operations for 2012 have officially begun! This year, our volunteer crews are operating three planting units. Jim Whitman, our new Regional Operations Manager, Ken Chyle, a first-timer with Farm Rescue, and seasoned volunteer, Charlie Hardie get some training on the new corn planter at RDO in Breckenridge. Dave Sette and Dan Pullum met up with Ken. They transported the air-seeder and started planting at our first case of the season near Java, SD. The farm belongs to Mike Hirsch who lost the fingers of his right hand in a machinery accident. He will be fitted with a prosthesis this summer and hopefully able to run his combine for the harvest season. We are honored to plant the Hirsch family's crop during their time of need and hope they have a bountiful harvest. Volunteers Charlie Bartsch, Jay Schepp, Warren Zakopyko, and Gene Spitchke head to their first case in Robinson, ND. Week of April 2, 2012: That old groundhog lied last month when he forecasted a long winter. The Midwest is enjoying a beautiful, early spring this year. As a result, Farm Rescue plans to assist farmers sooner than ever! In fact, 17 cases have already been approved for planting assistance. It’s not too late for farmers to get their applications in. There are still openings available for assistance. 2012 marks the ﬁrst year that Farm Rescue will be planting corn. 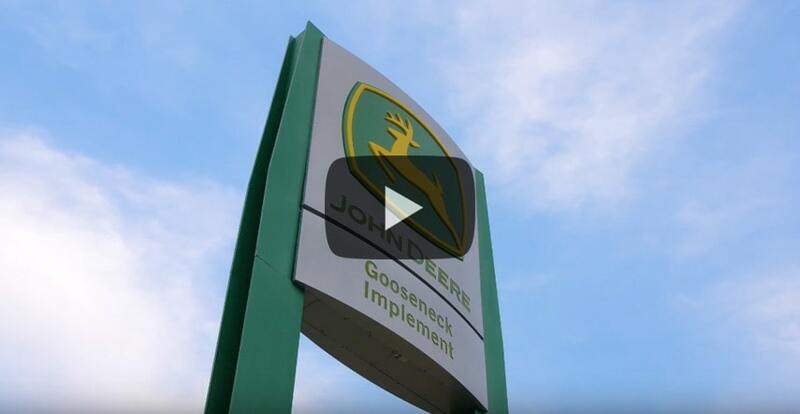 The generous people at RDO Equipment Company have donated the use of brand new John Deere 60' air-seeders, a 24 row corn planter, and the tractors to pull all the equipment. We are looking forward to a wonderful planting season!